Its kinda freakn’ hot here in Korea at the moment. Days are humid and sticky and, being the middle of the monsoon season, often pouring with rain with the odd bout of crackling thunder and sheet lightening. Exciting stuff! We’re certainly not complaining – after two winters back to back the heat is welcome as is the rainy season…it just serves as an exciting reminder that we’re having an adventure somewhere far from home. 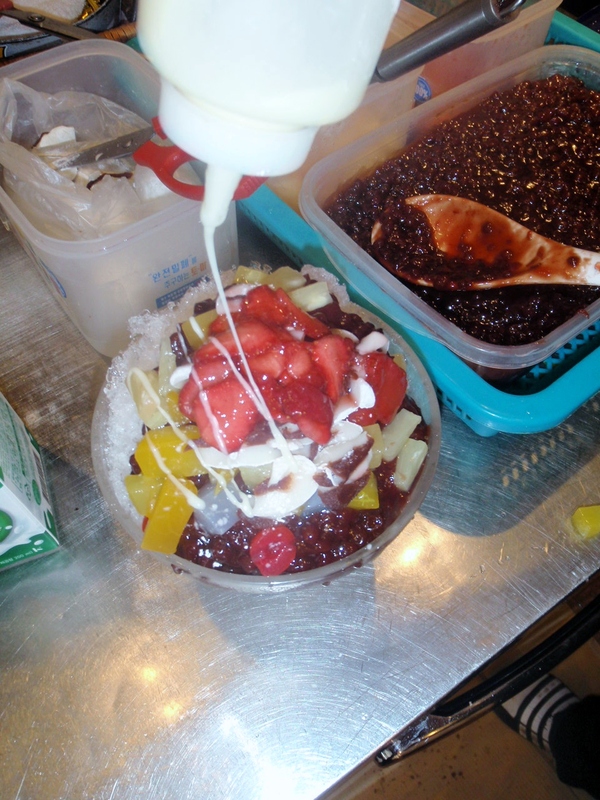 We have discovered that one of the treats that comes along in a Korean summer (along with the beaches ‘officially’ opening) is a cooling dessert item called 팥빙수 patbingsu. We’d seen random advertising cropping up all around the village but hadn’t given it even a second glance or put any thought into what it actually was. Our narrow-minded dessert budget had previously only extended as far as ice-cream. But that was all to change when one afternoon while visiting our friends at the bakery, Mi Soo sat us down and instructed us that we were going to be fed. She bustled around and TA-DA presented us with a large bowl of patbingsu. 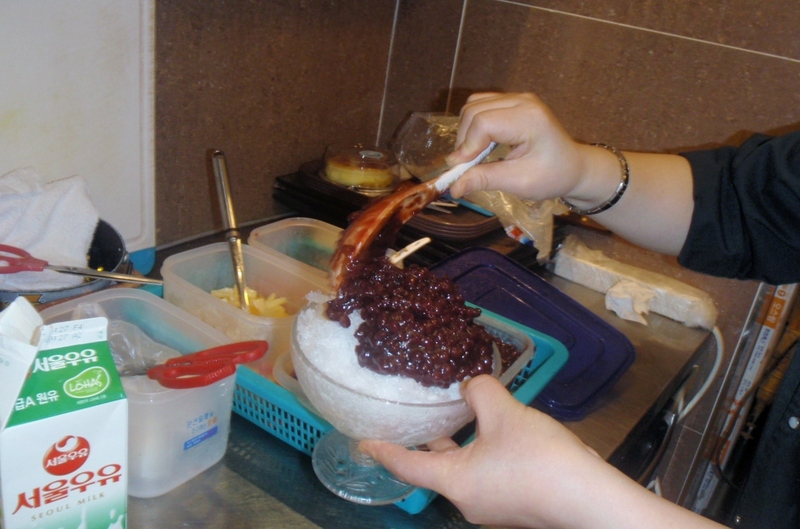 It starts with a bit of milk and then a generous layer of shaved ice… Then she smothered some sweetened azuki beans (sweet red bean paste also known as pat, 팥) over the top. Next, she snipped some red bean paste filled tteok (rice cakes) into the mix. Followed by a slightly confusing dollop of freshly cut tomatoes (well, they are technically a fruit, right?!) and an artistic drizzle of something white squeezed from a bottle. Before you know it, the final product! A heaving mound of stuff for two to share. After H-J shoved all the tomatoes over to Dan’s side of the bowl, we dug in…and although we were initially somewhat sceptical, it was actually bloody delicious! Its a rather refreshing dessert, thanks to all the ice, but also sweet and textural. Neither of us are fans of tteok normally (chewy, bland, rubbery crap that Koreans ADORE) but it provided a nice contrast to all the sweet and icey in the patbingsu. Now hyper aware to the advertising all around the village, we noticed that most places did more than one variety. And that’s how we found ourselves slutting through the Deoksin patbingsu scene to try out the many different toppings and styles. First stop, in which Dan needed absolutely no encouragement, was Baskin Robbins. They had four choices on offer: the classic, strawberry, green tea or milk tea. 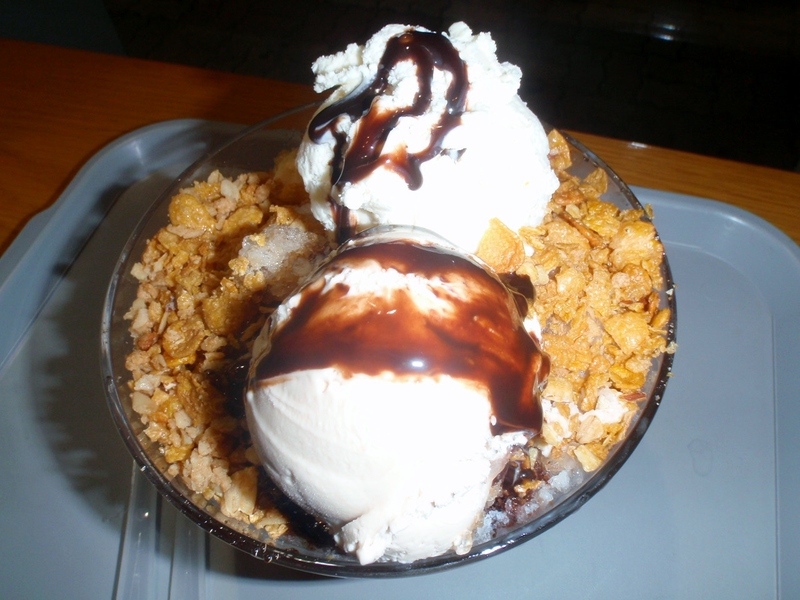 We opted for the milk tea one which came with two big scoops of ice-cream, a squiggle of chocolate sauce and some crumbled cornflakes. It was pretty delicious though pretty ice-creamy (not surprisingly!). Next on our hit list was the local branch of Paris Baguette, a bakery/cafe found in every nook and cranny of Korea. They had an initial menu of seven or so different varieties of patbingsu – alas, our ‘local’ had crossed three of them out with pen. Deciding to try something a bit fruity this time round, we chose the blueberry binsu. Little Deoksin village has recently had the pleasure of acquiring a new cafe! As cafe sluts in our previous lives, we were thrilled that there was a ‘third place’ to go and sip coffee and chill out that wasn’t a busy bakery. A proper, grown-up cafe. We’ve made it somewhat of a regular haunt due to its $2 Kahlua Coffees (H-J) and its $1.50 chocolate ice-cream waffles (Dan). 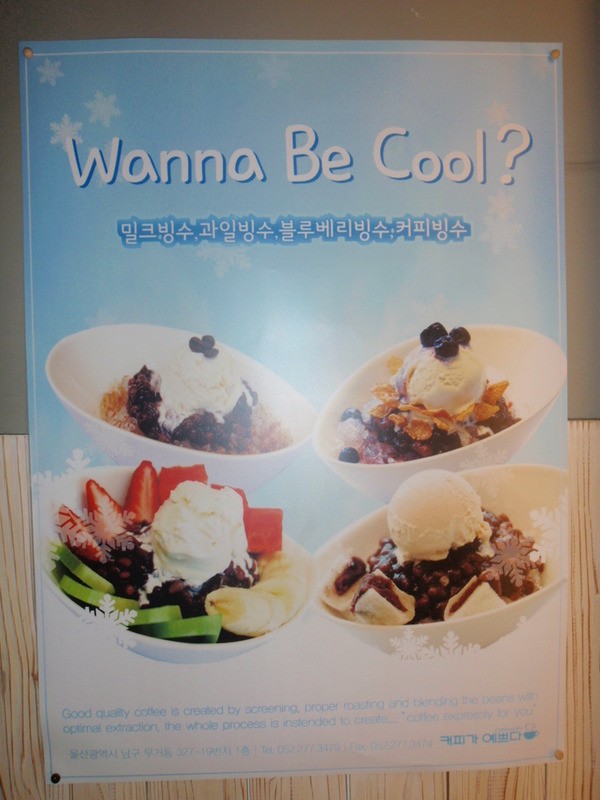 Of course, it was a given that we would be kind enough to sample their take on patbingsu! With three offerings, a standard, a fruit and what was intriguigingly labelled “couple bingsu” we decided to live dangerously and order the unknown. The couple bingsu arrived at our table replete with the pretty standard (cause we’re experts by now) toppings of bean paste, canned fruit, and lots of bean paste filled tteok. It was a shining example on a larger than average scale! Why, yes! Yes, we do! Of course, this cafe was good enough to have a coffee patbingsu on offer so naturally we ordered that. 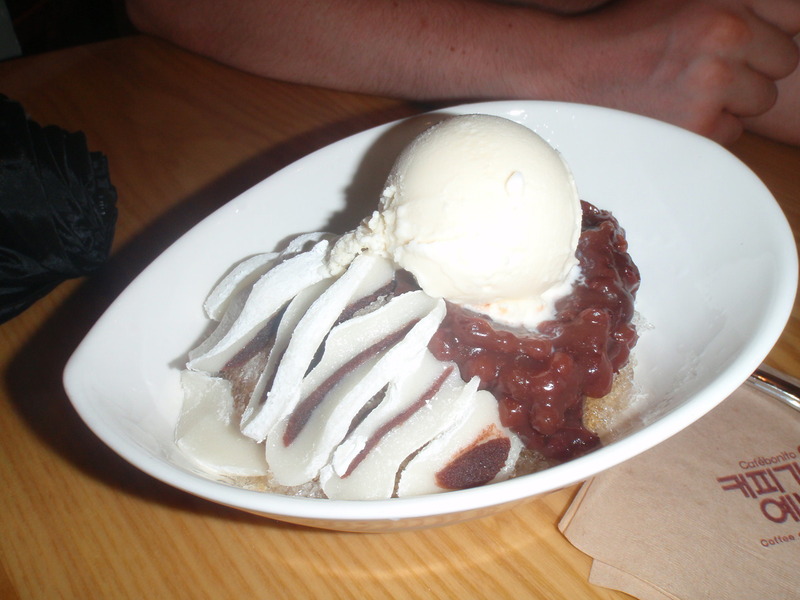 Coffee drizzled ice, a thick gloop of bean paste, tteok and a pristine blob of vanilla ice-cream, this patbingsu was a perfect balance of flavours thanks to its caffienated addition. Last destination on our patbingsu hit-list was another ubiquitous pseudo-French named Korean bakery, Tous Les Jours. 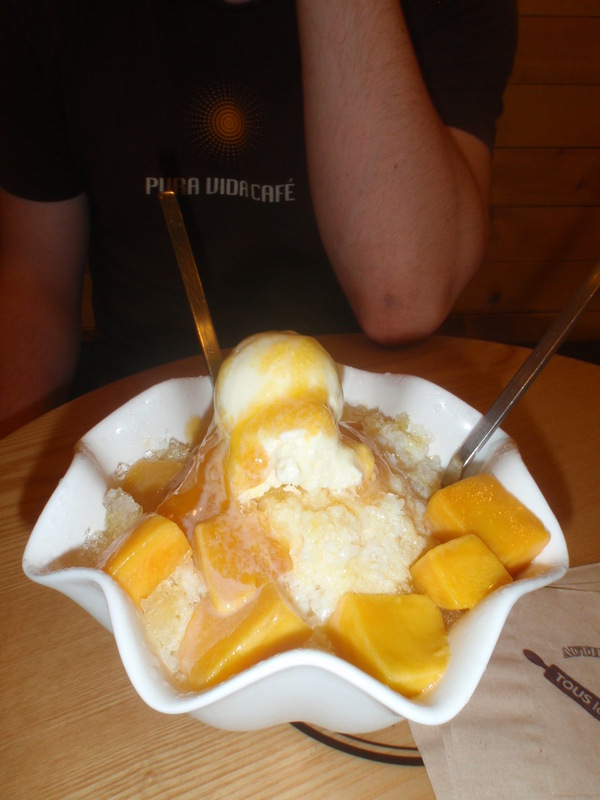 Perhaps riskily, we decided to give the fruit theme another try and duly ordered the Mango Tango Patbingsu. Now, we could be wrong, but the mango tasted much like actual FRESH mango which was a great change from the canned fruits often adorning these creations. 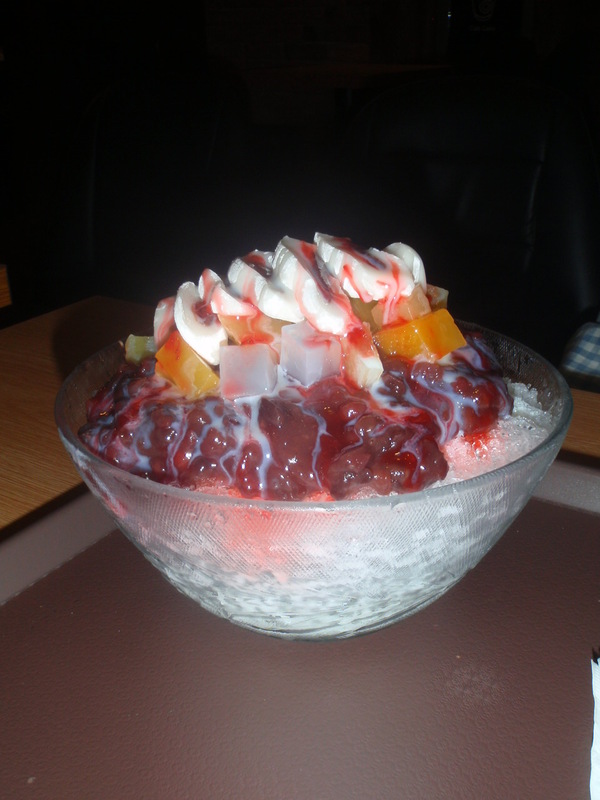 The syrupy juice wasn’t too overpowering either and all in all it redeemed the fruit based patbingsu for us. For a snack that had humble beginnings as simply ice shavings and sweetened azuki beans sold by street vendors, it has certainly morphed into something more elaborate. Given the chance on a hot summers day, its definitely worth trying it for yourself, no matter what toppings your heart desires. 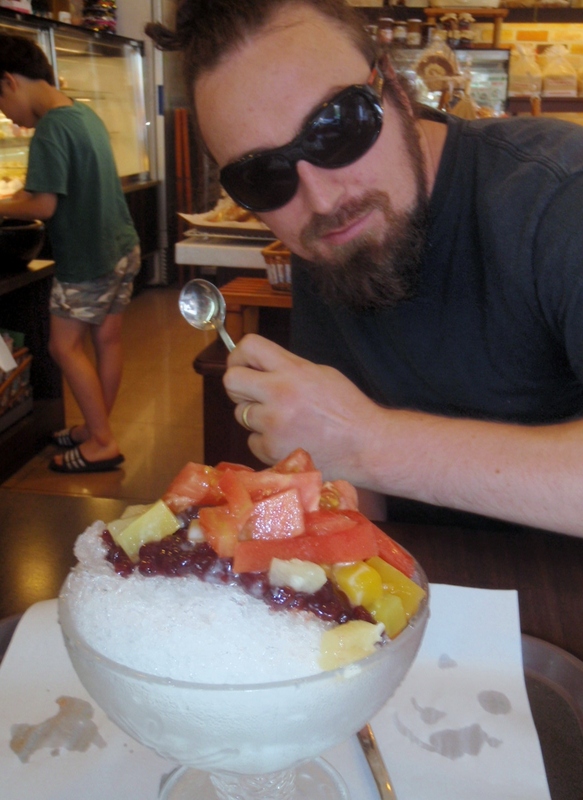 p.s For those of our regular followers who may be concerned about our health, please note that unlike the Busan burger challenge these patbingsu visits were not attempted over the course of one day. thanks for the reassurance, but it’s mostly ice and fruit right, so… pretty healthy? at least you’re getting some vitamins! I think most of the major chains do them…but remember, we live in a teeny tiny village and have now experienced the entire village’s worth! Haha. Perhaps next time we’re in The City, we’ll check out some more. OMG that’s over 40 degrees celsius!!! You must be roasting! Its humid here (most days it gets up to 98% humidity) but only in the low 30s as yet. Sounds like you need to be hanging out in a walk in freezer! They prepare it for you. There’s generally a menu of three or four different typesm you order and HEY PRESTO its delivered to your table. You can get them to take away at most places too. Korea isn’t really big on desserts (other than American ice-cream & donut chains of which there are literally thousands) so it was nice to try something new. I was lucky enough to try a bunch of random Thai sweet street snacks a couple of years ago in Chiang Mai and there were some incredible things….YUM! Just what we need here, they temps are in the high 30s…coffee or mango for me please! We had similar in Taiwan, so good!!! I could go for mango one right now! Totally popular in Japan too!!! Minus the tomatoes + rice cakes on top! Yummmmm, I’m missing the sweet adzuki beans here in Calgary! The rice cakes I’m growing to like…raw tomatoes on my dessert though, NOT so keen, haha. Its so interesting to discover these random treats that don’t exist where we’re from, eh?! That’s it eh, you never know until you try! We probably would never have bothered to try on our own volition so we’re lucky that our friend shoved on in our direction 🙂 Yummy. hahaha I feel so cold now!!! How did you guys try all of them! Unbelievable! 😉 Honestly, I am not a big fan of 팥빙수, but I want some now! Stay cool! Glad to inspire you fridge-ward 🙂 Hehehe! The tomatoes were pretty random, must say. But this post made me miss Japan and its icy mounds of kakigori in the sticky summers! Ewww that’s crazy hot. 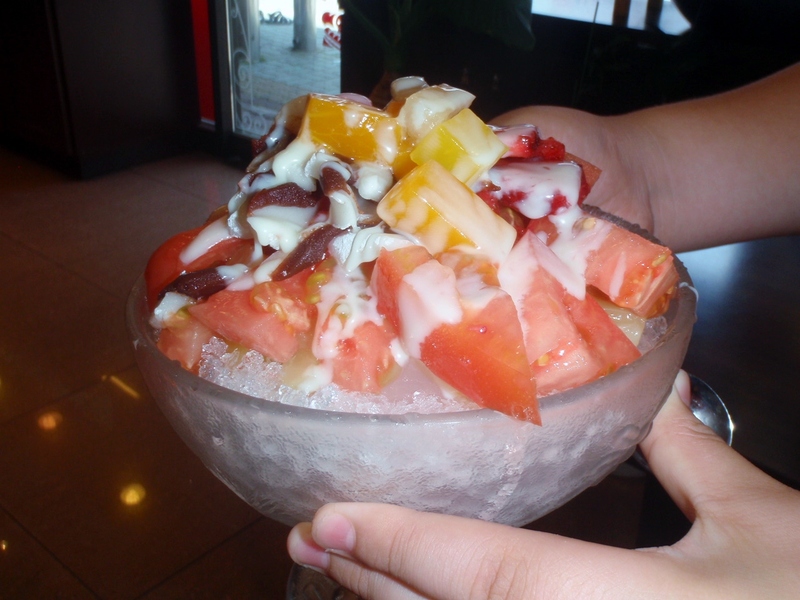 It sounds like you would need more than a mere bowl of shaved ice – perhaps a trough!!! mmm that looks so yummy! Korea seems like a fun place to be. Pretty tasty for sure! Korea definitely has some fun bits and some really crazy bits – its been a rollercoaster that we’ll remember far after we’ve left. Whoa whoa whoa, hey now, what’s with the tteok hate? Lol. I forgive you, even though I love tteok 🙂 Glad to hear your patbingsu consumption was spread over a few days because if you’d done all that in one day… wow… that would be both disgusting and impressive! Lol, its true – the addition of meat fat makes anything ridiculously doable….mmm…now I’m having dreams of duck-fat fried potatoes…. Wow! 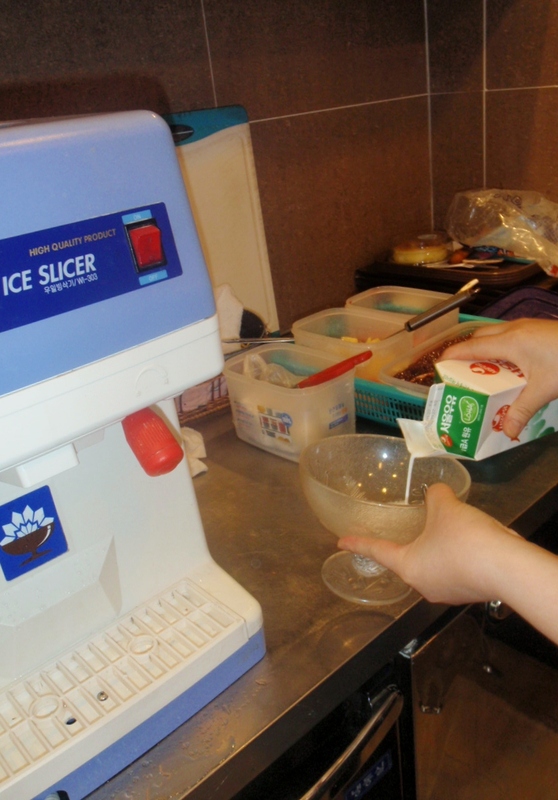 I was never sure about that red bean paste on ice cream (not uncommon over here too)…. but tomatoes????? Never in my wildest dreams! Nah I’m in total agreement that tomatoes on your dessert is odd! 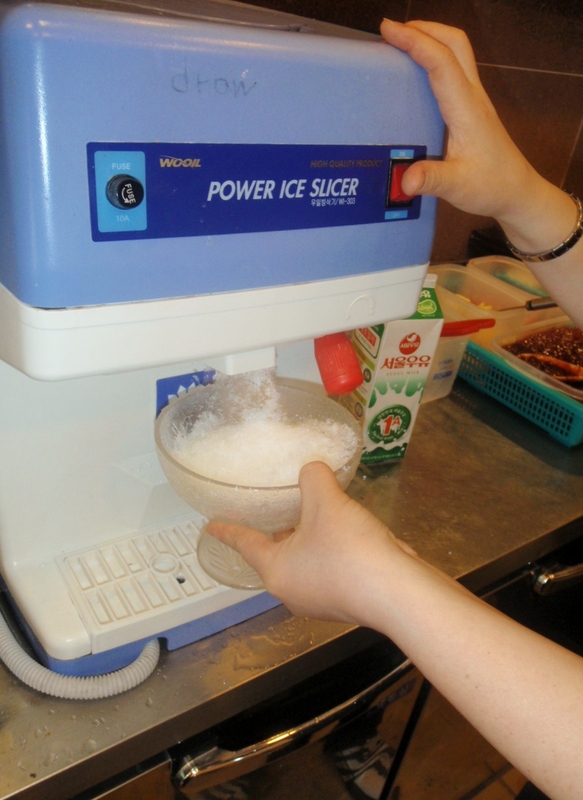 Luckily, this has only occurred once to date…I think its worth trying patbingsu in its Japanese form while you’re there – its nine tenths shaved ice so really cooling in these muggy temperatures. I’d be interested to know what the Japanese variations are too! There’s some serious dedication, right there! Patbingsu reminds me of the Malay version of Ais Kachang, one of my all time favourite things to enjoy when traveling in Asia, yes they love to put veggies in their desserts, (sweet corn anyone!) I rarely drink coffee but a coffee-Affogato style Patbingsu might be my kinda thing too. As for back to back winters I totally get why you’re enjoying the warmer months now! Plus warmer days means more shaved ice! You’ve made me very curious about tteok. I keep envisioning chocolate swirled somewhere on these desserts! Thanks for posting the info. I’m just venturing in to Korean food. Patbingsoo is my absolute favorite Korean dessert!! 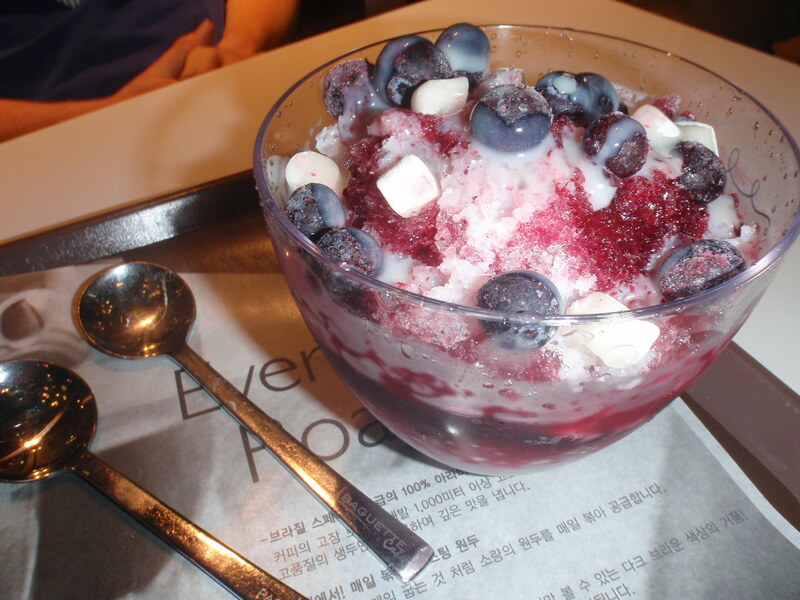 I too have been trying lots of different varieties here in Seoul, although I’ve never had one with tomatoes… The summer heat makes it all too easy to justify eating bingsoo on a regular basis. They are definitely a refreshing hit on these hot summer days! Not keen on the tomato topping but the variety of fruit, ice cream, coffee and other flavourings keeps things interesting 🙂 A good excuse to work our way through the list, hehe.